Paul Allen: Above the law? 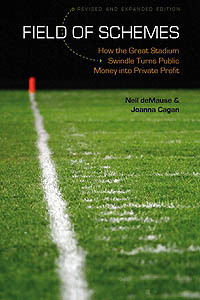 The 1997 law seems clear on the face of it, requiring “the team affiliate to publicly disclose, on an annual basis, an audited profit-and-loss financial statement.” While the law defined “team affiliate” as “a professional football team that will use the stadium and exhibition center, and any affiliate of the team designated by the team,” Allen chose only to open the books of First & Goal, the shell corporation he created to manage the stadium, without revealing the finances of the Seahawks themselves. The state Public Stadium Authority backed Allen’s contention, arguing (and I quote, thanks to the Seattle Weekly): “The word and can mean either and or or, depending on the context within which it is used.” Apparently there’s one grammar for the rich and another for the poor, as well. Cowboys’ record-breaking stadium to spark new building war?